After we spent a couple of afternoons at the stables with Jessie Mare, we still hadn’t had enough! The smalls still asked everyday to go see Jessie. Since we couldn’t go out there everyday, we brought the stables into our very own kitchen! 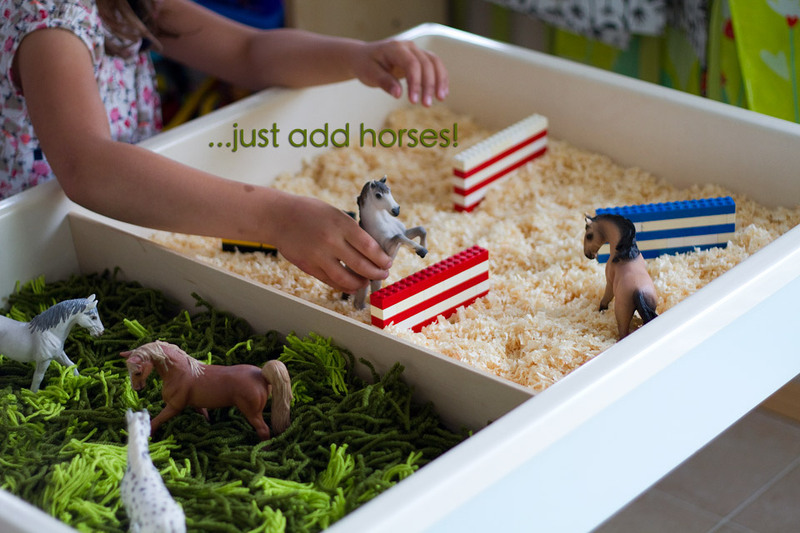 It was really very simple and provided many hours of horseplay! 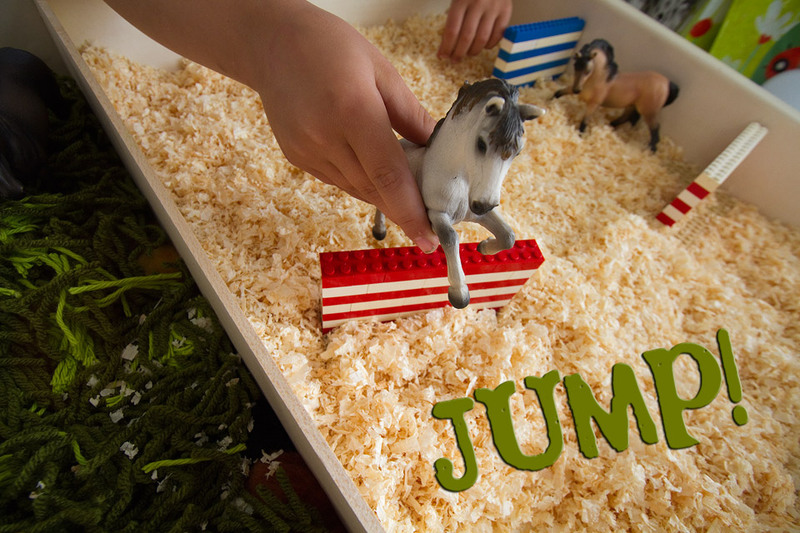 We made our jumps out of lego blocks. We got help making those from my teenager Emily! 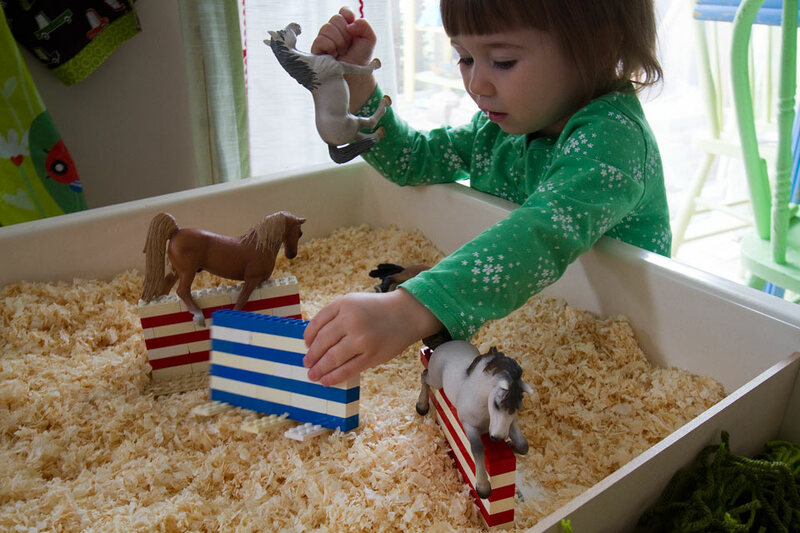 She made them nice and sturdy so the horses wouldn’t knock them over easily. And then the play began in earnest. 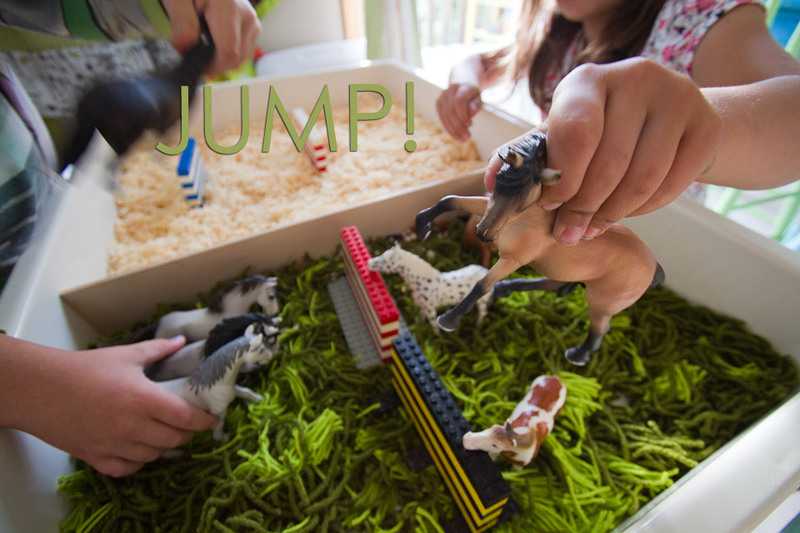 And boy, oh boy, could those horses jump!! It was as if they had grown wings! This small world activity was a complete success with all the ages of children in my home…from under 2 to 7! And yes, the wood chips will get in your yarn meadow. No doubt about it. But remember, the smalls don’t mind…only us grown-ups get worked up about that! It was hard to watch the little flakes of wood get mixed up in the yarn, but I had to let it go and let them have fun! 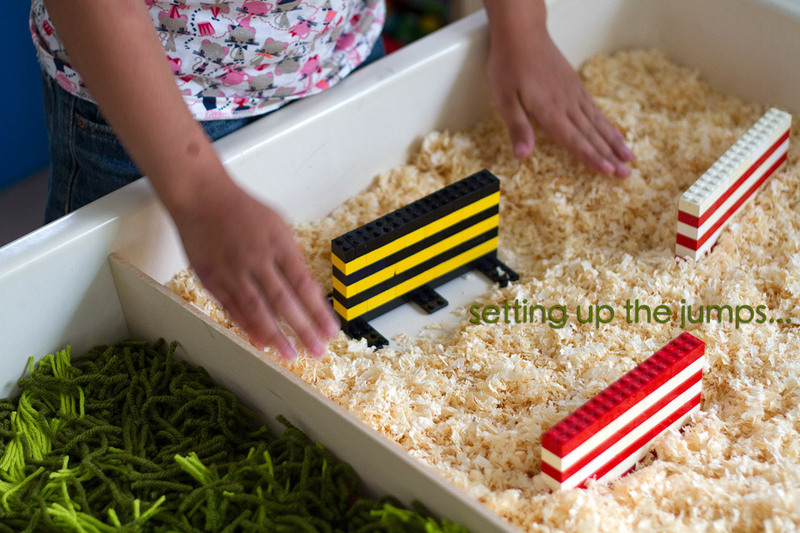 If you don’t have a sensory table to set up this activity, that’s quite alright too! You could make it in a shoebox, a plastic bin, or a cardboard box! We made it in the big table because we have so many friends who want to play with it all at the same time!! 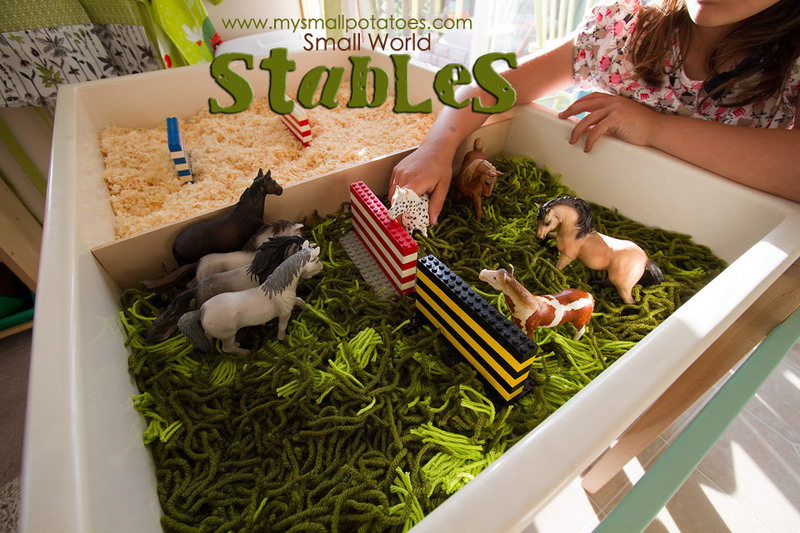 We sure hope your wee ones get to enjoy their own small world stables sometime…it really is fun! 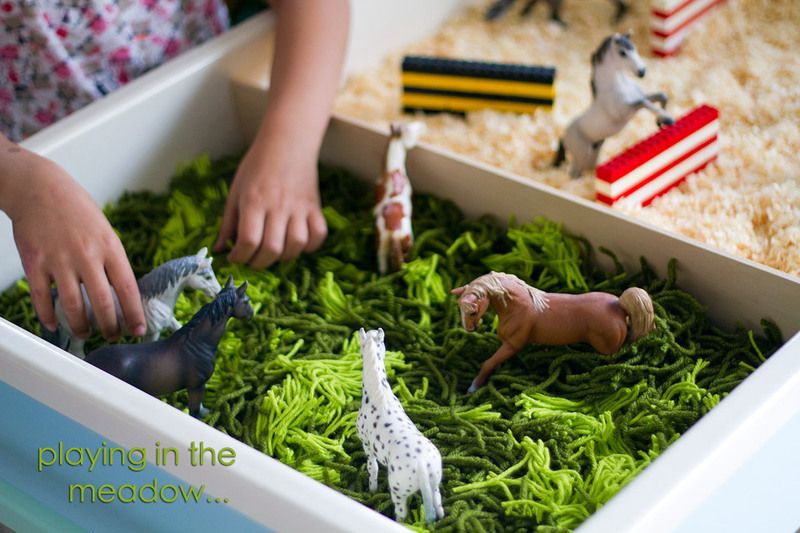 And when you’re finished, you can pack it away in big ziplock bags and bring it out when you feel like playing. Or even better, if you build it in a bin with a lid, it can slide under a bed and come out again and again without any prep time! 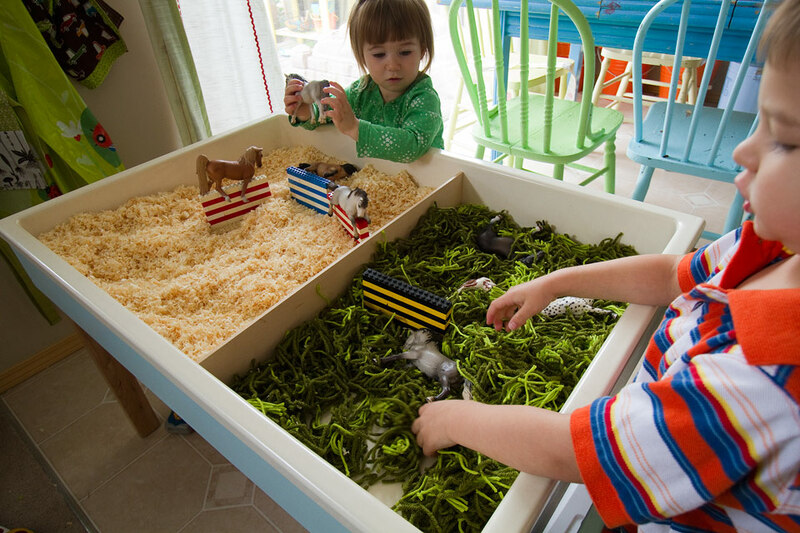 Did you build the sensory table or was it purchased somewhere? I purchased it through a teacher’s store years ago. It used to be plain brown wood. But over the years it was worn and rotted from all the water use! We recently overhauled it and gave it a paint job! Now it’s better than brand new!! So clever! Wish I had little ones again to do this with. This is so great. 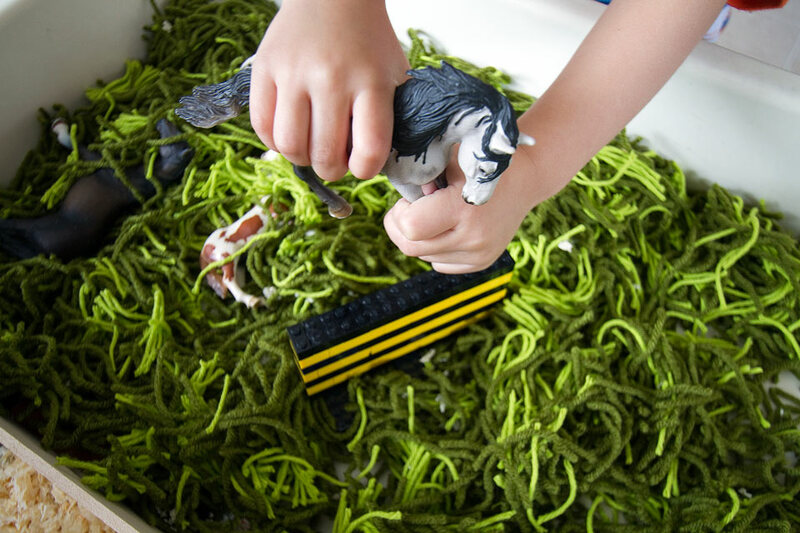 I love many of your sensory play ideas. I operate a home daycare as well and many of my kids are young. 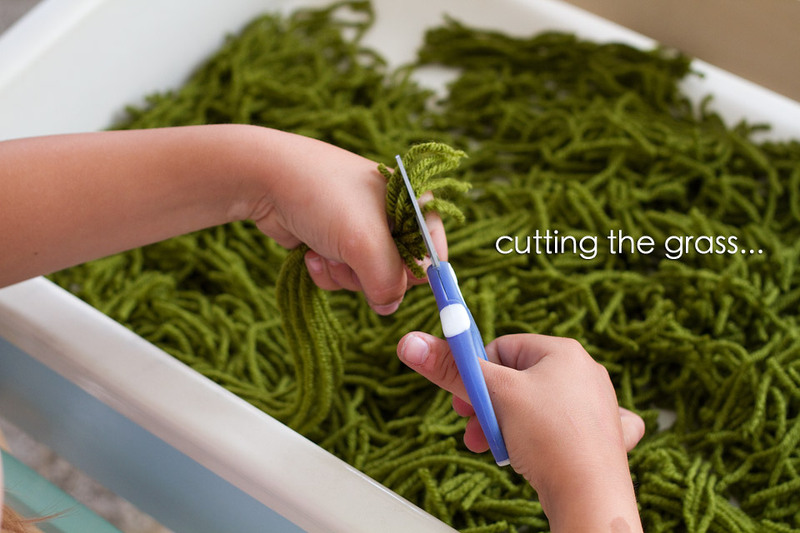 Do you have problems with the young ones throwing wood chips, yarn, rice, etc out of the bin? Not so much throwing, but definitely there are spills. When the kids play in the bins, I put the lid underneath the bin to catch most of the spills. The rest we just sweep up at the end of playtime. 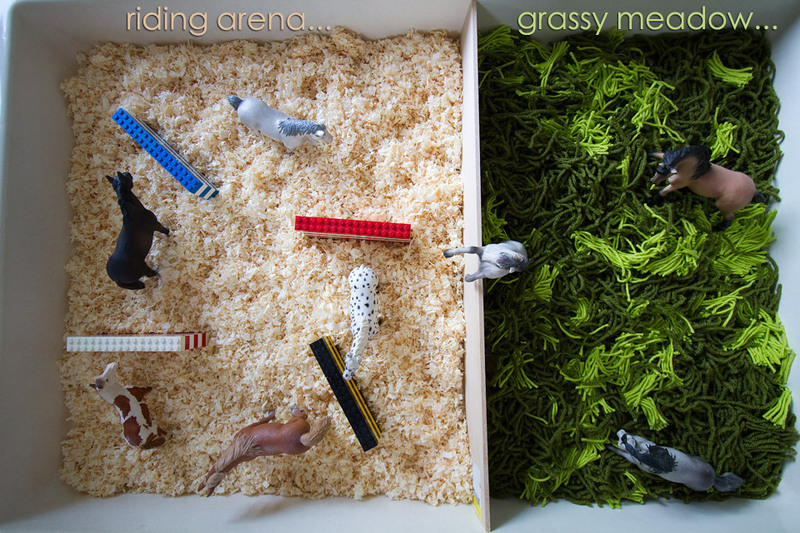 The stables did get mixed up by a couple of rogue toddlers that thought the grass should go in the arena 😉 We have guidelines for “bin playing” though. The toddlers need reminding, but the preschoolers do really well! This piece is very inspiring. It has got me wondering how I could be more creative in dealing with my own kids aged 2 and 4. I will try to have them look at this. Obviously, it is gonna have them asking me for several things. Thanks Al. I love the meadow and cutting of grass. My little one will love it! This is wonderful! 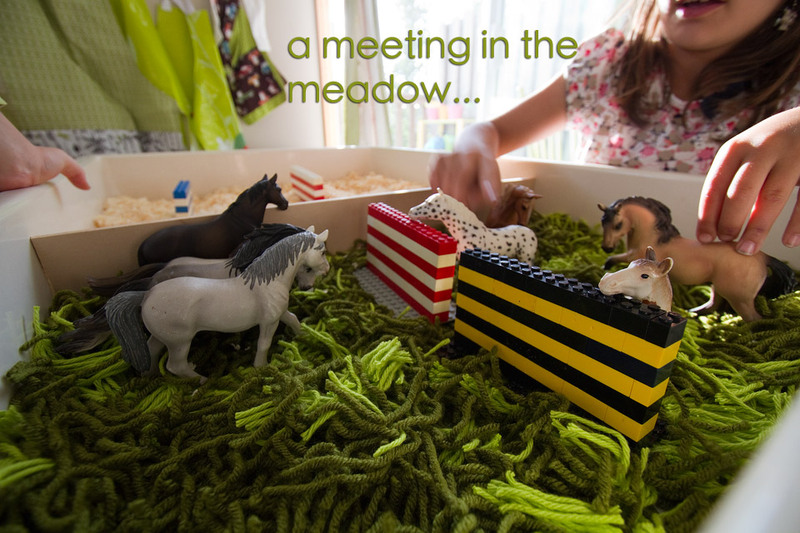 I loved my horses, I recently entrusted my herd to my niece… they deserved to be played with. I love this idea, so clever. Thanks so much for sharing. Wow! I love this so much though I’m wayyy overage. 🙂 Wish I had some space in my tiny apartment to display this! I love the yarn grassy meadow. I am definately going to try this. It’s hard to find activities to keep my 4 year old girl engaged, since my 2 year old boy dumps and throws everything! Wow! This is an amazing set up. So natural- the way we like it here.